I’ve been working from home for nearly three years now and my schedule changes on a day to day basis. I’ve always struggled to find my work at home groove, until I learned to go with the flow. I figured I’d give you some of my best tips. Ready, set, go! I am one that likes to stick to what works. However, sometimes what works doesn’t always go well. That’s why I started trying new things. You know, working when my kids are awake instead of just when they’re sleeping. Don’t be afraid to ask others for hints as well. I put off exercising for so long because I thought it interrupted my work. If I can’t find an hour to exercise during the day, then something is wrong. When did we start putting our health over our work? Taking care of yourself is sure to help you get your work groove back. I always fight myself on taking breaks while working. I’ve discovered over and over again that the more breaks I take then the more productive I am. I realize that not everyone is like this, but I am and it helps me keep my work at home groove. 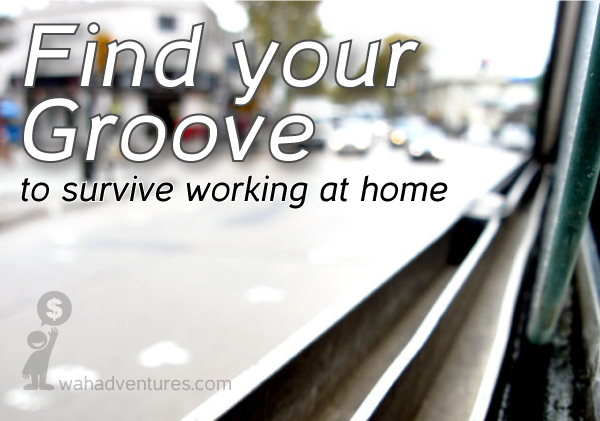 One reason you lose your groove for working at home is because you lose your passion. Do whatever it takes to get your passion back. We often get so caught up in the negativity of life as humans and work at home professionals that it’s easy to lose our passion. I started working at home to be at home with my kids and for some reason I always forget THAT. Duh! I have to keep my drive and passion for working at home or it just-won’t-work. I’d like to keep writing you and telling you how to find your work at home groove, but I’ve got to get back to work. Good luck on finding that groove! Tell us more about how you lost your work at home groove, but eventually found it in the comment section. I just got back to my exercise routine after going on a hiatus for the holidays. It feels great after a good workout but getting started is a you-know-what :). This is so true! It’s so easy to get in a funk when the fact is, working at home opens up a whole new set of opportunities. I love working from home because I get to see my son more often and I’m not as stressed. I need to remember that when I’m feeling disappointed or overwhelmed with work. Thanks, Jess!